Support / Plugin Support / Separate "Incoming Terms" for every Related Term field. / Reply To: Separate "Incoming Terms" for every Related Term field. Reply To: Separate "Incoming Terms" for every Related Term field. I explain something to do in detail. I want to make the flexible relationship for every keyword using custom taxonomy. By the category of wordpress, I cannot set two or more parents to one keyword. Then, I set “Related Terms” to custom taxonomy, and I want to be able to set two or more parents to one keyword. 1 ) Input a parent keyword into the “parent field” of each keyword. 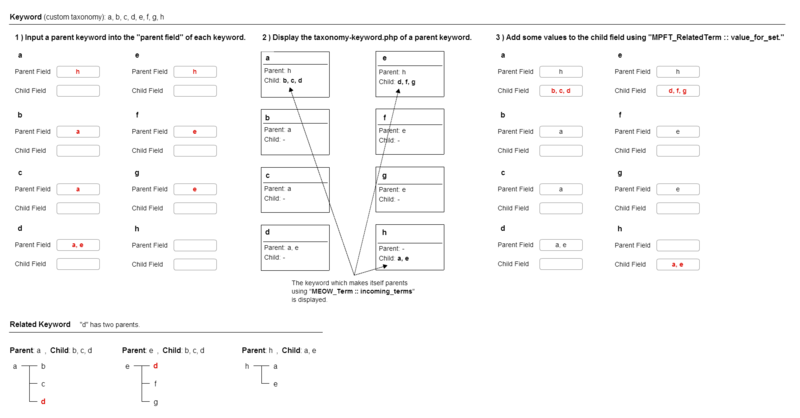 2 ) Display the taxonomy-keyword.php of a parent keyword. The keyword which makes itself parents using “MEOW_Term :: incoming_terms” is displayed.